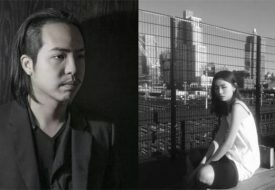 With Hello Kitty turning 45 this year, lots of different brands are launching special collaborations with Sanrio to celebrate this big anniversary for the iconic character. One of our favourites so far is the Melissa x Hello Kitty collaboration, just recently launched on 15 March. 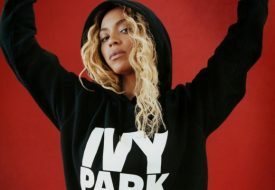 Just one look at the products and we’re losing all our cool already, because they are super cute. Or should we say, kawaii! We love pretty much anything that the popular Brazilian jelly shoe brand puts out, and this collection is no different. Fans of Sanrio and Hello Kitty, this is a collection you need to get your hands and feet on! The Melissa x Hello Kitty collection includes various styles of footwear for both adults and children. If your little ones are also in love with all things Hello Kitty, here’s a chance to get some mother and daughter-matching shoes! 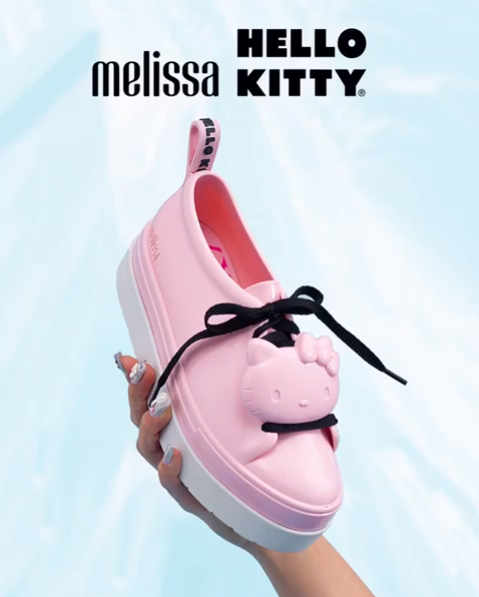 Our favourite style from the collection has got to be the Melissa Be + Hello Kitty sneakers, available at $180 a pair. The Melissa Be sneakers take your streetwear game to the next level with a sporty cool look that’s also elegant, thanks to the glossy plastic finish. 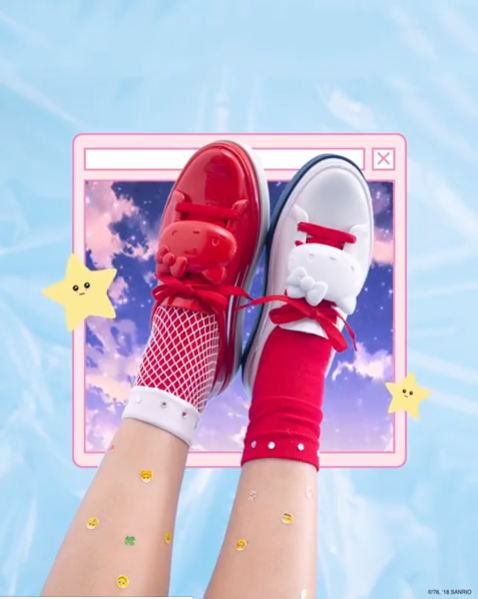 In this new collection, the 3D detail of Hello Kitty’s face adorning the laces adds another dimension of adorableness to the original Melissa Be look! You can choose from white, black or pink colours for Melissa Be + Hello Kitty sneakers. Get the matching Mel Be + Hello Kitty sneakers ($135) for your little one to match! This latter style comes in kids sizes and a beautiful deep red finish. Want even more options to match with your mini-me? Then you’ll love the Mini Melissa Be + Hello Kitty sneakers ($100 a pair). It’s like a slip-on sneaker version, and now Hello Kitty’s face is in its full colour on the laces, with a gorgeous big red bow at the back! There are four different colours to choose from: white, red, pink, and black. Your little one is going to look so kawaii in them! Something perfect for our Singapore weather – slippers! 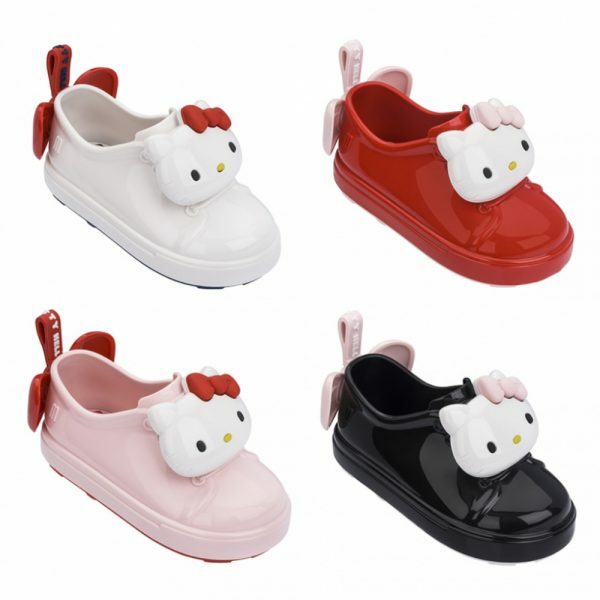 The Melissa Slipper + Hello Kitty style ($120 a pair) will make the simple running of your daily errands a cute and charming one, with the eye-catching 3D detail of Hello Kitty’s face on the upper. You can choose from white, black and pink colours. Now, what about more formal occasions? The Melissa Space Love + Hello Kitty flats ($125 a pair) are so versatile – great for just hanging out with your pals, and great for work, too! They bring a touch of youthful sweetness to any look, and we bet they will get you lots of compliments. 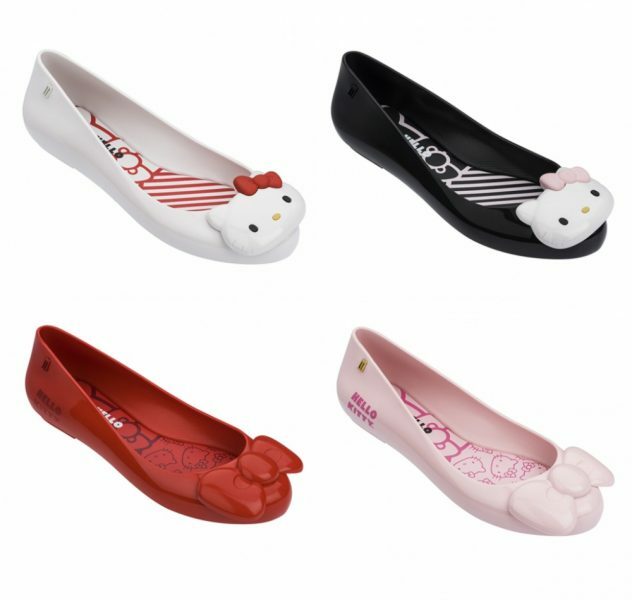 The flats come in white or black, with a Hello Kitty face detail at the tip. There’s also a style with the iconic Hello Kitty bow, in deep red or pink. Once again, Melissa got your “Mommy & Me” moments covered! The flats are also available in kids sizes perfect for your little ones! The Space Love + Hello Kitty flats are sold exclusively at the Melissa @ Wheelock Place store and online at mdreams.com.sg. Based on the stock at the Melissa online store, many of the products are selling out! So act fast, and snag the pairs that you love now! You can now shop what is dubbed as Melissa’s “most kawaii collection” yet exclusively at the Melissa Wheelock Place store, or online at mdreams.com.sg.